Happy Sunday, I hope you've been enjoying your weekend. We've had some warmer weather come through for this time of the year, it's been in the mid 60's - quite enjoyable! This week MJ issued this sketch challenge. Taking a few creative liberties, I rotated the sketch and added an extra panel on the right side to fill some empty White space. 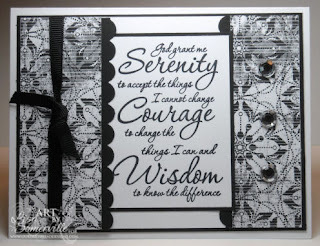 The sentiment from Our Daily Bread Designs Serenity Prayer was stamped in Black Archival on White card stock. 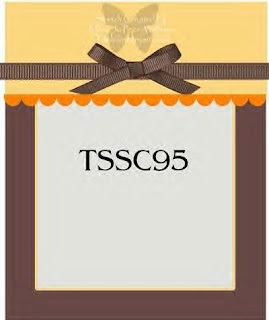 I paired it with the beautiful Night & Day Specialty Paper from Stampin' Up! for a classy Black & White look. The Scallop edges were created with the Scallop Edge Punch, the Silver Bling are Kaiser Stick on Gems. This is so pretty! I love the way you used this DSP and the extra panel is a perfect finish! Very nice! Love the black and white! Beautiful card, one of my favorite papers SU! carries! Lisa this is beautiful, I love that sentiment. Great job, I love it on the side with the extra panel. Thanks so much for playing along.